They are back, the always popular four brothers on the half shell. Not only in a new CGI movie, but in another game! The game itself follows the story line of the film, with a good sprinkling of tutorial levels in flash back style of game story telling. Each one of the heroes has their own signature style of movements and awesome abilities and some really off the wall, er over the wall, er well acrobatics over the city roof tops. Harness the power of Ninjitsu and become a master of combat Leonardo, Raphael, Donatello and Michelangelo are playable and each have unique acrobatic moves, weapons and combat skills, such as Michelangelos fast nunchuck face slap and Raphaels powerful Sai throw. 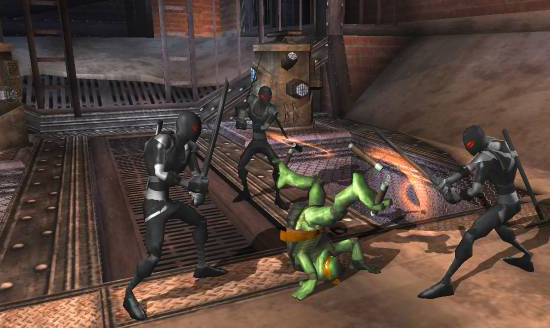 Characters from the movie and the original comic book series including the Purple Dragon Street Gang and the infamous Foot Clan and a whole new group of enemies creep out of the shadows to face the Turtles. The environments that find their way into the game are of course from the film as well, the Turtles pretty much have to depend on all of their skills and each other, as strange other worldly beasties and villains plague the Big Apple. Danger is not only in navigating the canyons of New York City by way of the very nifty acrobatic moves, but also from the many enemies. Of course combining skills and fighting skills into new combos is a sure way to keep the Turtles on top of things. The games graphics lend themselves very well to the Teenage Mutant Ninja turtle Franchise, Showing off the city and even more importantly the Turtles themselves. The gangs all here, Raphael, Donatello, and Michelangelo, and Leonardo. Guiding the Heroes along and moving the story along is Splinter the Rat Sensei. Sounds and music are passable and are in line with the game content. At first glance I was not expecting much at all for the game. Almost writing it off as strictly a kid’s game I came around pretty fast. Playing around for a bit with the tutorial brought back memories of other games where skills at getting to the next level was a driving force for every kid with a pocket full of quarters. I was more than pleasantly surprised to find the game appealed very much to me. There is something very pleasing about playing this game; I just cannot put my finger on it. Maybe it’s because the Turtles as characters have always had such a powerful appeal. Something worthy of noting as the player navigates through the city and fights all of these unique enemy, (Including the Foot Clan) the Turtles true power has always been through team work. Like some of the awesome combo fight moves they can perform, so to must they team up to get to some harder to reach places. 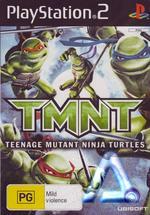 Teenage Mutant Ninja Turtles developed by Ubisoft Montreal and Quebec City studios for the Xbox 360, the PS2, the PSP, PC, GBA, NDS, GameCube and Wii. Parents a bit worried about the content can search online for the Demo and have a go at it before they decide to purchase for the kids. Yea, right. As soon as you play this game title, you are going to buy it and the kids won’t get a chance to play.